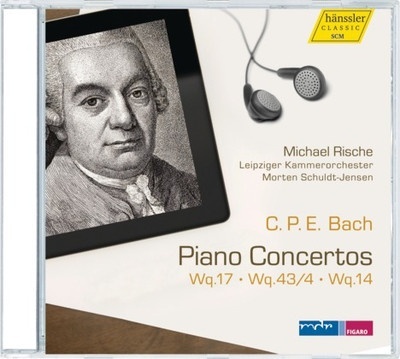 Piano Concertos Wq.17, Wq 3/4, Wq.14 - BACH C. P. E.
C. P. E. Bach's piano concertos are eloquent testimonies of the musical "Sturm and Drang". Moreover, they are unusual mediators between Baroque and Classic. The CD at hand presents the second part of the concertos in an excellent recording with Michael Rische and the Leipzig Chamber Orchestra. In addition, the solo version of the Concerto in C Minor Wq. 43/4, which is recorded on this CD, is a world premiere recording! Bach's concertos impress with the passion of their themes. Especially the concerto in D Minor Wq. 17 carries the listener with its musical drive. In the first movement, vivacious string cascades alternate with lyrical piano solos. The second movement resembles a relaxed serenade. The third movement is rhythmic and catchy. The Concerto in C Minor Wq. 43/4, which has been recorded in the solo version for the first time, is the first piano concerto in music history that consists of four movements - nearly a hundred years before Liszt und Brahms! Furthermore, Bach left it up to the interpreter whether he wants to play with the accompaniment of an orchestra or solo. The cyclic structure is interesting as well: The last movement repeats the themes of the three preceding movements. In the final Concerto in E Major Wq. 14, Bach once again presses every button. The opening movement shows itself easygoing and happy, the slow movement is sensitive with dolorous chromaticism. The opus concludes with a cheerful and virtuosic allegro.